For sliding gates that do not have enough space to open into completely. Allows the use of two gates that slide into almost 1/2 the normal area. 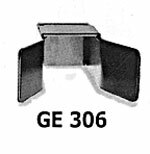 GE 306 Gate end guide. Secures end of gate in closed position. For 2" thick gates and under. ES 130 End sprocket assembly with chain guard. For rear-mount installation of sliding gate operators. 3/16" steel back plate with 1" diameter shaft. TV 201 10 ft. steel V-track section. TM 202 V-track asphalt mounting plates.